"Conscientious and responsive professionals. The project manager was a pleasure to work with. Chose Significant Homes to finish a basement and refresh a large 25+ year house, largely because they were the general contractors when the house was built. It was a good decision that must have avoided many of the surprises common when dealing with older houses. They still had some of the original structural, electrical and plumbing plans and were able to bring in some of the original subcontractors. Would call them again." "I can say this with all sincerity that there is not a more qualified and honest contractor. Having delt with a horrible prior situation, my husband and I were very wary of this building process. It has been almost 4 years and Matt and Whit still continue to touch base and help with little projects. Not only is the quality impeccable, but the character of this father son duo is what sets them apart from all others!! If we had to build a house in Alaska we would somehow find a way to make significant homes do the project." "Significant Homes has done an outstanding job for us. Matt and Whit are a pleasure to work with. They are conscientious, budget focused and super efficient. We gave them a tight deadline to work with. They have stayed within our original budget and kept us on track for a move in date. Those qualities are hard to find these days. The foreman on our job is top notch." "Excellent work, on time and on budget. Very professional management and great sub contractors. We have worked with Significant on many projects and recommend them highly." "I just wanted to reach out and thank you for a phenomenal job. You guys really did a stellar job. It turned out even better than we imagined." "I have enjoyed working with Matt Matthews and the Significant Homes team finding them resourceful, reliable, and imaginative. I hope to work with them again soon." "As a subcontractors we have the privilege to work with Significant Homes on numerous residential projects! We have found Significant Homes to be highly organized and professional in every way. It is a pleasure to work with them! We highly recommend you consider Significant Homes for any of your home building needs." "Gaston & Wyatt has been delighted to work with Significant Homes as a supplier of millwork and cabinetry. Their approach is professional and organized, which makes the work of subcontractors easier and translates into reduced costs and tighter schedules for their clients. We highly recommend Whit and Matt and their great team at Significant." "As a real estate professional in Greenwich I have had the pleasure to tour some of the homes built by Matt & Whit Matthews. I can say, without a doubt, that Significant Homes is one of the premier builders in our area. As a friend and colleague I can say that they are a pleasure to work with, always honest, diligent and ready to go the extra mile for their clients." "Having been involved in the past with four fairly major building projects, involving two very good builders, I would vote you number one. Never have I seen a project go so smoothly. Everyone on the job was pleasant & professional & you were always cheerfully right there when needed. Katie & Dan have been most fortunate to have you & thanks you for your help & Expertise." "Dear Matt, I just want to tell you and your whole crew how pleased we are with the results of the work you all did at our new place. On time, well done, and always with the most pleasant spirit! I (almost) will miss all your nice faces and "can do" attitude, it was really fun. I am sending an e-mail out to friends & colleagues to tell them of your wonderful work. I thank you!" "Significant Homes exceeded all my expectations with integrity, passion and sustained will. Your job supervisor was a pleasure to work with on a day to day basis and is a true gentleman and a great project leader. You interface seamlessly with the other professionals we brought in to the job and we would happily refer you to friends in the future." "We have been a Vendor of Significant homes for many years. They conduct and operate at a high level or professionalism. They are accurate in their approach and extremely organized. It has been a honor and pleasure to work with their entire team." "I was walking around the other day on a visit, and noting what a nice job you did building the place. Just wanted to pass that along while I thank you for continuing to help my parents in their advanced need. Really gives me comfort to know you are doing that, and to know how much they enjoy seeing you." "My wife and I enjoyed working with Matt Matthews during the construction of our home. He and his company did a phenomenal job. We found him to be completely reliable, responsible and honor able in every way." "Thank you so much for all your hard work and commitment to our project at Peabody Lane. From the moment you agreed to sign on I knew we were in great hands. The quality of the work performed here is exceptional and your eye for detail pays off in the long run. Each and every tradesman that helped on our house was a pleasure to work with and I could tell how much they all respect the Significant Homes name. Thanks again for bringing our home to life." "I’ve been working with the team at Significant Homes since 1999. Over the years they have produced many of our finest homes. In each case, they have brought superior craftsmen to the projects, maintained a focus on quality, and provided excellent management. Whit and Matt Mathews are fully committed to meeting my goals as a designer while not losing sight of the owner's expectations regarding schedule and budget. All around, Significant Homes is an excellent choice for any substantial project." "Significant Homes built my 8,000 square foot house. Matt Matthews and his company are beyond compare. There is no such thing as perfection, but they come as close as I,'ve ever seen and I have built several houses. Additionally, long after the project is finished--years after, he is always available and stands behind his work 100%. Personally, he is a man of tremendous integrity." "Significant Homes is currently managing a 12,000 sq/ft re-build for my property in Mead Point. I thank my lucky stars every day for hiring Significant Homes. My project has continuously evolved and has endured many complications. With Significant Homes guidance and execution we have not lost a min and the project has turned out better than my wildest dreams. I have never once questioned their integrity and dedication to my project. I'm very comfortable saying I believe we have continuously hired all sub contractors at their very best price. It's been an absolute pleasure working with Significant Homes and I'd be happy to speak with anyone interested, in addition to giving a tour of my project. Please do not hesitate to contact me." "Significant Homes" Custom Builders brings a tremendous amount of experience, knowledge and professionalism to all their projects, large or small. Over the past 20 years, James Schettino Architects has been fortunate enough to work with Matt & Whit Mathews on many beautiful homes. They are true experts in their field and working with them has always been a positive experience for not only us, but more importantly the clients. We highly recommend you consider Significant Homes for any of your home building needs." "We hired Significant Homes to be the general contractor of a new home we were building. They did a fabulous job. They were on top of every detail. We relied on them to run the project. No detail was overlooked. We are so happy with my new house. We would hire them again without reservation on any project we do in the future. Significant Homes become like family and they still follow up with me know to see how everything is going. Top notch!!!" "Matt, Whit and Signifcant Homes have been exceptional throughout a major renovation of a big house. And one everyone thinks weve done in record time, and I'd agree with that. From day 1, they've been totally on top of the many subcontractors, have kept the project totally on time (and as said, we had an aggressive time schedule). They've also been within budget and every item has been separated as its own budget item, so we could easily assess the situation. In some cases, when prices seemed high, Matt and Whit got as many as 7 other bids. The house was beautifully built about 15 years ago, and all improvements we made are also of the highest caliber. They've also gone beyond what's necessary in several somewhat unrelated issues. I would only say all this is I totally felt it and I do. I can sing their praises very high." "I have had the pleasure of working with Matt and Witt Matthews of Significant Homes on multiple projects almost non-stop for the past ten years. They are skilled at sourcing high quality sub-contractors at competitive prices. Whether it is a fixed price or a cost plus contract, I know that I can count on the team at Significant to price the work aggressively. They stay on top of the job, from start to finish, ensuring that work is expertly crafted and that my clients are happy throughout the process. It is important to me that I can count on them to respect and enhance my design ideas. Significant’s extensive experience, fair-minded attitude, and hands on approach leaves it few rivals. We look forward to working with them again soon." "This company engineered and built a 10,000+ sq ft home for me in Greenwich, Ct. and a 4500 sq ft home for me in Nantucket, Ma. Both homes were crafted with meticulous detail, elaborate and exquisite materials and bespoke design. In the case of the nantucket house they came in under budget and in the case of the Greenwich house there were never any discrepancies and the need for very few changes or variations from the original plan, which kept the project running smoothly from beginning to end. 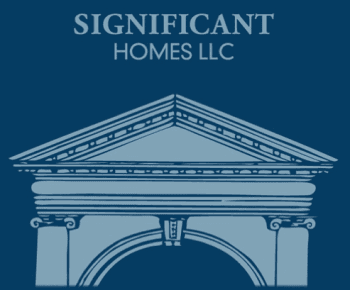 All employees affiliated with Significant Homes LLC were not only professional, but also a pleasure to work with. I've had other experience with builders/developers and this company remains high on my scale." "Matt Mathews built my home in 1999 and then did a major renovation in 2012. Both experiences were great and I would be happy to recommend him for any home building project." "Matt at Significant Homes is an ultimate professional. He is extremely creative in finding solutions to problems that you would not expect. The whole team has a high moral standard and just wants to deliver the best work." "Great leadership, very knowledgable about all aspects of construction and finall finishing. I worked with this firm well over the last 20 years and the end product made Clients happy and it reflected well on entire team." "Thanks Significant Homes we did our first renovation on our Antique home with no problems or concerns. Matt was always there to help and add his professional opinion. I would always recommend them for any job… old or new." "We used Significant Homes for a re-model / addition. Project was completed on time and above expectation. They have a great sense of style and we were very happy that we listened to their suggestions and improvements to what we were looking to do. Would recommend them." "We worked on the interior design of a ground up project with Significant Homes for over 2 years. They work exceptionally well with the architect, client and designer. They bring on highly skilled sub contractors and manage the project very professionally. The quality of craftsmanship is outstanding and their attention to detail makes working alongside them very easy." "Our company, Dynamic Architectural Windows has been supplying custom windows & doors for luxury residential homes all over the North America for more than 22 years. Over that time we have had the opportunity to work with some best and most talented builders and architects in the business. We can state with confidence that Significant Homes stands out as one of best in their attention to detail and professionalism. Our experience with Significant Homes has included some of the most complex custom details we have every manufactured and we would not hesitate to recommend them if you were looking for a builder that can deliver when attention to detail matters." "It was a pleasure working with Significant Homes on the Pool House / Garage. Matt and Whit are true professionals and were a pleasure to work with every step of the way. They worked diligently to perfectly execute every project detail making quality and craftsmanship a priority. They were always prepared for our weekly meetings and worked hard and creatively respecting the client's budget and schedule. I look forward to working with them again and recommend them highly." "Significant Homes under the leadership of Matt & Whit Mathews were awarded a very complicated addition and renovation project on the water in Greenwich CT which we had designed. The home offered many challenges and they conquered them all. The project was a huge success and their team were very organized, highly motivated and a pleasure to work with. On a project with a significant budget they were able to present very competitive pricing, worked to a tight schedule but did not sacrifice quality in any way. I would gladly work with them again and highly recommend them for all of the reasons above." "We have worked with Whit on many projects and always is professional, detailed and his work is timely and efficient. We would recommend Whit and his team highly. We have worked with Whit for the last 20 some odd years..."
"We have worked with Significant Homes LLC for over 20 years. They are always professional and have the highest standards of quality and workmanship. They are a pleasure to work with and always exceed expectations." "We provided all the site work for an extensive renovation including demolition ,foundation excavation, and utility trenching to numerous locations on site. This job was very typical of a Significant Homes Project. It was well organized and supervised making our part of the job as efficient as possible." "Significant Homes has a long history with Innerspace Electronics. We have worked with Matt Matthews on dozens of jobs together since as early as 1996. From the very first project with Matt, to the most recent, we have found Significant Homes to be highly organized, professional and exemplary in every way. They take great pride in their work and the finished product is excellent. We are honored to have the opportunity to work with them." "As a Decorative Artist I have worked on a number of projects with Significant Homes and have always found them to be professional, detail and Client oriented. They are also very respectful to and knowledgeable about the trades that they bring in or work with on site. This is a huge plus in finishing a high end project in a seamless and trouble free way. Everyone in the firm that I have had contact with is a professional as well as a pleasure to do business with."